They wear red, but they trade in the gold and silver of success … Liverpool F.C., feared, formidable giants of British football. And into the ‘eighties they go … as well-equipped and as hungry for prizes as they have been throughout the decade they have dominated. If the secret of Liverpool’s success could be found in a bank vault, I wager the rest of football would collaborate to pull off the most daring robbery of the century. But their mystique, their magic, is not something you can touch. It exists within the very heart of Anfield, a ground that has become as much a part of football folklore as any of the world’s great arenas. Walk through the portals of Anfield and you can feel it … the atmosphere, the spirit. It coxes from every nook and cranny. Everything is right from top to bottom. That craggy old Scot, Bill Shankly, and wise men in the boardroom started it all in the late ‘fifties. They drew up the recipe, and when Shankly left, five years ago, the recipe was handed down. There was no upheaval, Liverpool made Shankly’s right-hand man, Bob Paisley, one of their most loyal servants, team manager. He took over and lifted the club to the pinnacle of achievement. “Continuity and stability … that is the secret of our success,” says John Smith, the proudest chairman in the land. He sits at the head of a board that includes three men, Sidney Cecil Reakes, Cecil Hill and Harold Cartwright, each with more than 20 years’ service. And as we examine the team behind the team of the ‘seventies, loyalty is the overriding factor. The directors, the administrative team headed by general secretary Peter Robinson, the kitchen staff, the cleaners, all weld together in the Liverpool cause. But it is the 10 men who make up Paisley’s backroom team who are the unsung heroes. Part-time and full-time, they have together contributed around 275 years’ service to the club. 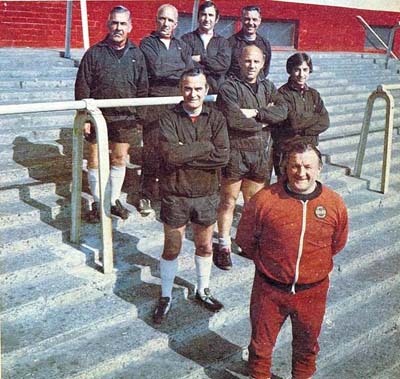 Paisley himself has been at Anfield 41 years as player, trainer, coach, assistant manager and since Shankly’s unexpected departure, as manager. His assistant is Joe Fagan (21 years’ service), his chief coach is Ronnie Moran (30 years), Reuben Bennett, once chief coach now invaluable as an assessor of Liverpool’s opponent’s in the First Division, has been 22 years at Anfield. Geoff Twentyman, ex-Liverpool player, now chief scout, moved away for a few years but has had 19 in the club’s service. Tommy Smith, ex-skipper and dubbed “The Anfield Iron,” has just returned, as junior coach. He can tot up 20 years. And so it goes on … with Anfield groundsman Arthur Riley the most loyal servant of all. He has been with the club since he left school in 1928 and his father was there before him. “My biggest job is to stop anybody getting out of line – at any level, manager, director, player, coach. It needs only one person to get a bit carried away with our success and the whole lot could be blown sky high. “You look at clubs where there has been trouble and it is usually the result of somebody having too much of an ego, feeling too important for the club. “I know groundsmen who runs some clubs. At others it is the chairman, manager, secretary or someone else. “It would be so easy for me to start shouting my mouth off. I’ve had enough success. But it would be fatal. And that’s why I try to keep a low profile. The heart of Anfield is the bootroom. On match days, visiting trainers are invited inside for a drink. When they have yelled their lungs out for 90 minutes, sometimes at each other in the heat of battle, they shake hands and open a bottle. Before and after a hard morning’s training, the Anfield “backroom boys” head for that same cubby-hole. 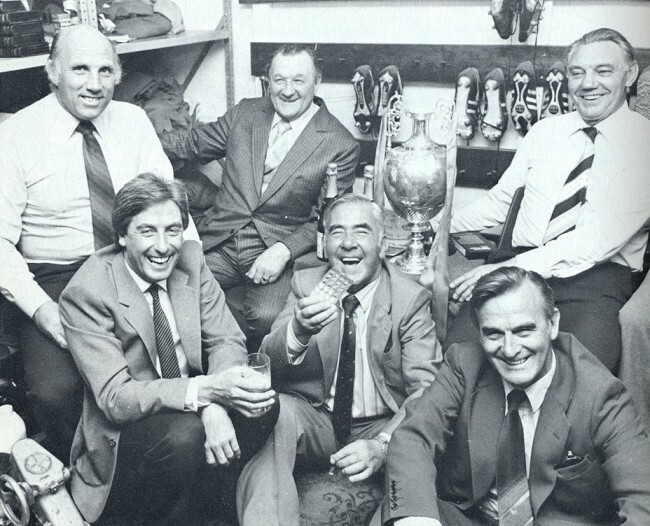 Bob Paisley feels more at home there than he does in his carpented office. Often the chairman looks in. And always the talk is of football. Moran joined Liverpool from school 30 years ago. Like Paisley, he has played and coached at all levels and run on with the sponge. Now he is chief coach and he talks the Liverpool way. “The players make it easy for us. One or two float in the clouds, but we knock them on the head. At training sessions we say ‘Big-head from Saturday over here.’ They know. They walk over with a laugh. Twentyman, a tall, quiet-spoken Cumbrian, joined Liverpool as a player 26 years ago. He played, went away to try his luck elsewhere, came back and has been chief scout for 13 years. Not every kid jumps at the chance to join Liverpool. What they have to offer does not include back-handers and bribes. When the money really talks it is in transfer fees, wages and bonuses. Liverpool pay well, recruits well. Perhaps that is the most basic ingredient of all. Hi again, Kjell. It’s been a while. Listen, hope you don’t mind: this isn’t a comment but a request. In your research over the years, have you come across the first name of W.E. Forshaw, a 1920s referee who I believe was born in Liverpool? This is a long shot, but I hope you don’t mnd me asking. If you want to email me, a) my address is crisfreddi@hotmail.com, and b) thanks a lot. I am looking int this, not had any luck yet.